Fitz has returned to Buckkeep, but it's far from the hero's welcome that might have been imagined. He serves the Queen and spymaster Chade incognito, posing as Tom Badgerlock, bodyguard and servant to the visiting "Lord Golden" (in reality, the Fool, likewise in disguise). He now has to train Prince Dutiful in the ways of both the Skill and the Wit, whilst also investigating the threat the Piebald (militant Witted rebels) pose to the crown. But delegations from overseas arrive, one from the Outislands to the north and another from the Liveship Traders of Bingtown, both emissaries bringing opportunity...and great danger. The Golden Fool is the middle volume of the Tawny Man trilogy, as well as the eighth book in the wider Realm of the Elderlings series, bringing the overall series to its halfway point. Its predecessor, Fool's Errand, was one of the stronger single novels in the series, with a very good, mostly self-contained storyline. The Golden Fool, alas, isn't quite as strong at standing on its own two feet, but it is very much what readers have come to expect from a Robin Hobb novel: introspective, brooding but also a deeply human work of fantasy fiction. 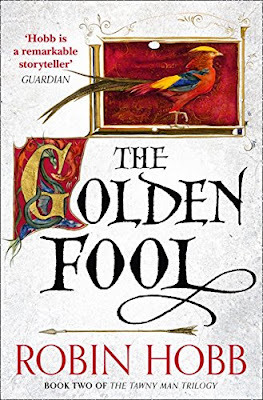 The Golden Fool centres itself on Fitz's relationships at Bukkeep, with Queen Kettricken, Chade, his foster-son Hap, Prince Dutiful and, most notably, the Fool. The Fool has always been the most enigmatic character in the series (for all that he is the only character to appear in every book to date) and Hobb has been very careful not to give away too much of his secrets. This book doesn't really get into that either, instead being more interested in the ambiguities of Fitz and the Fool's relationship. That's not to say there isn't any action - the plot turns on a very brutal sword fight - but it's definitely a quieter and more introspective book than even the norm for Hobb. At first I thought the detailed account of Fitz's everyday comings and goings for the Fool, Chade and the Queen was a prelude to a more traditional fantasy narrative (as was well-done in Fool's Errand) but instead it turns out to be the whole book. This makes The Golden Fool a prime example of "middle-book" syndrome, one which exists to bridge the start of the story to the end. Still, even a slow, bridging Robin Hobb novel is a cut above most fantasy. The prose is exemplary, the characterisation is absolutely first-rate and it's a brave and refreshing fantasy novel where the most important thing that happens is a quiet (but brutally honest) conversation between two old friends. And it does leave the story in a very interest place for the next novel in the series, Fool's Fate. The Golden Fool (****) is available now in the UK and USA.